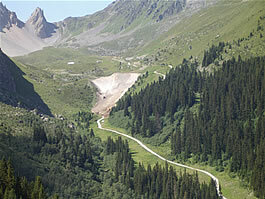 New in The Three Valleys. 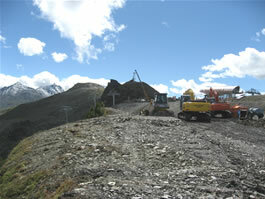 New lifts in The Three Valleys, New Piste in La Tania. New for 2007 / 2008. 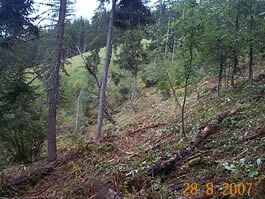 The steep black top section of Tougnette has been reshaped - only reddish steepness now. I always remember Tracy of Ski Higher having a fantastic high speed fall down there a number of years ago - she walked away fine though (to get her skis, poles, hat, goggles etc which were left high up, strewn across the mountain). This high speed / slow boarding detachable 6 seater chair replaces the top section of the Tougnette Gondola heading out of Méribel up to the ridge above St Martin. Using the recently upgraded 6 seater Plan de l'homme chair from the Chaudanne will make this side of the mountain even more accessible without having to take your skis off. Over the ridge the old Allamands chair out of the Les Menuires / St Martin valley is being replaced with a 6 seater high speed chair (probably with an optional hood/cover that seems to be preferred in that area). In Val Thorens the Caron & Cairn gondola cabins have both been upgraded to modern 8 seaters and the mid-station is going to be the same as Peclet with toilets, passes etc. 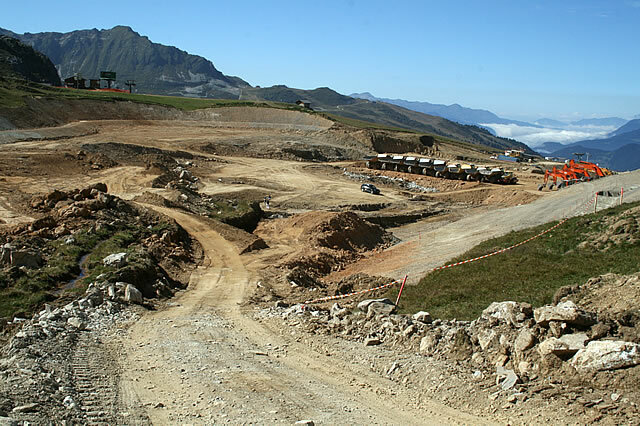 A massive new snow cannon reservoir is being constructed above Courchevel 1650. This is situated over the back of the top of the 6 seater Signal chair lift so remember to go hard right a little earlier to re-join the pistes when dropping straight off the top of the lift in to lovely fresh snow. 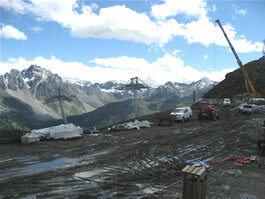 First pic shows the top of the Roc Mugnier chair in the background and below that shows the top of the Signal chair. 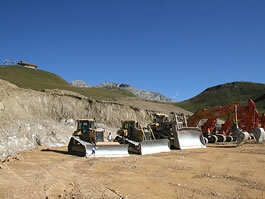 Volume of the reservoir at l’Ariondaz: 125,500 m3. Length of the pipes involved: 8,000m. Water is piped up from the Rosiere lake at 1500m to the new Ariondaz reservoir at 2500m, water is then kept there so that it is already nice and cold (important for the production of man made snow) and then piped to the Biolley lake at 2000m when needed. There's lots of newly modeled areas of pistes all over the Three Valleys to improve snow retention and to face them away from direct sun plus to improve drainage, prevent erosion and for safety reasons. The bottom of the Creux run can be seen here has been considerably widened and new safety barriers have been installed on the Boulevard Gravelles returning from 1650 towards 1850. 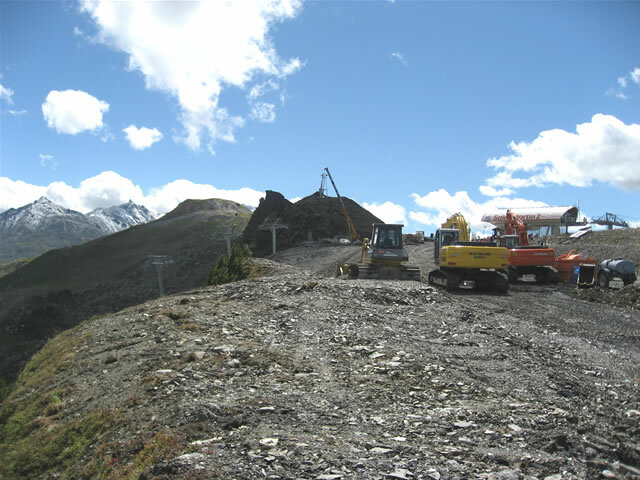 Some reshaping of the the top of the Bouc Blanc and many new sign posts (especially around the top of La Tania) have been erected. 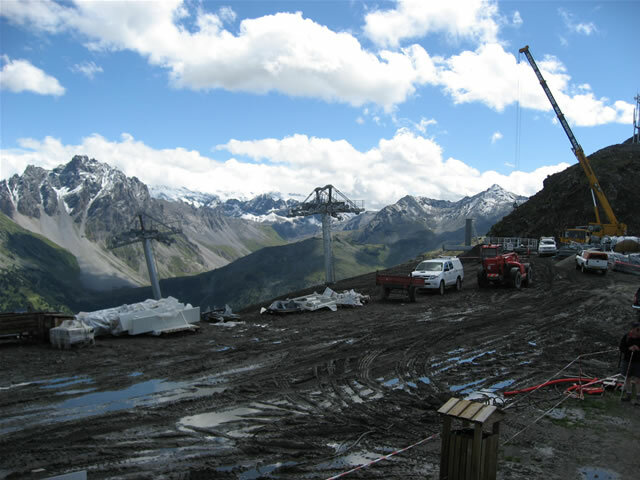 More new Gazex avalanche control machines, upgraded snow cannons and a massive new snow cannon reservoir above 1650 has been constructed. 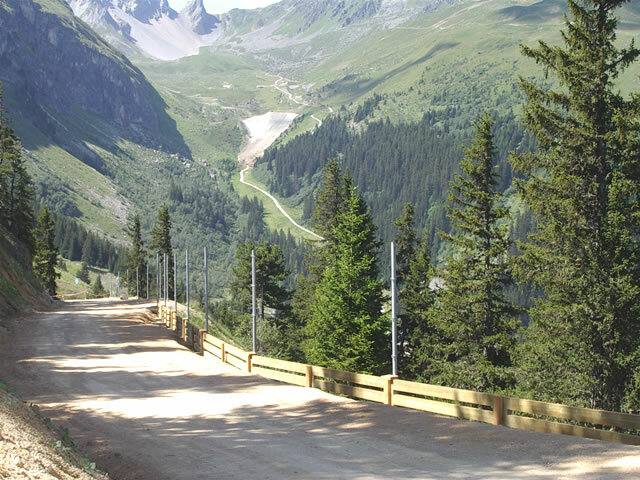 The Saulire cable car and Le Praz gondolas now have ramps rather than steps and the steep gradient sections of the Pyramides drag tracks have been reduced. 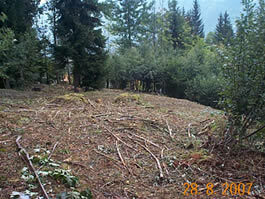 Further work is being done on the La Tania green run. 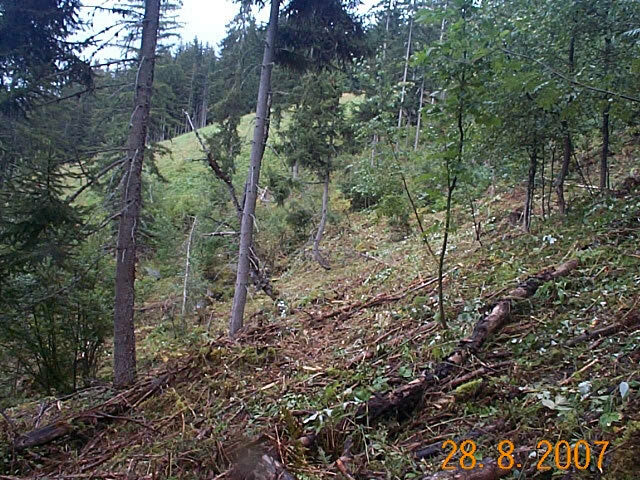 Pics show the clearance of the forest with Moretta Blanche in the background. 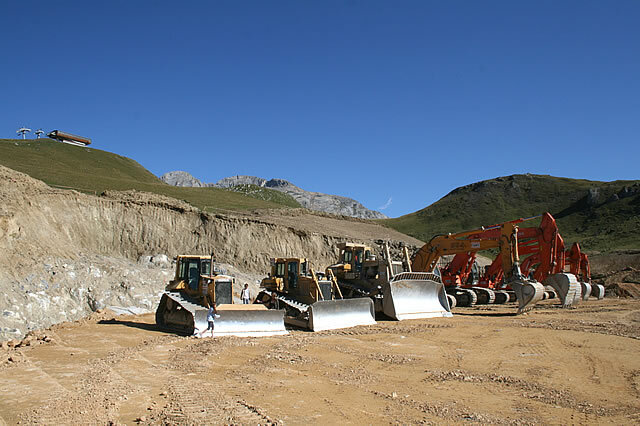 According to the Director of Europrestim who mange the development of the La Tania infrastructure they are going to put in the remainder of the green run straight down to the La Tania gondola (as an alternative to the link back to the top of the Troika). We put the proposed development plans to this up on the site back in 2004 but there's still nothing new on the proposed new chairlift. 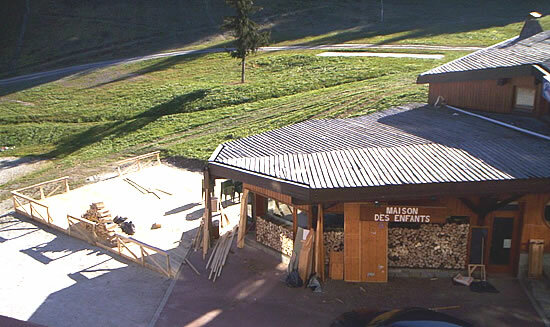 The new bar for La Tania this Winter taking shape from Le Farçon team, it replaces the Maison Des Enfants Crèche. Or is that gonna be the name of it? 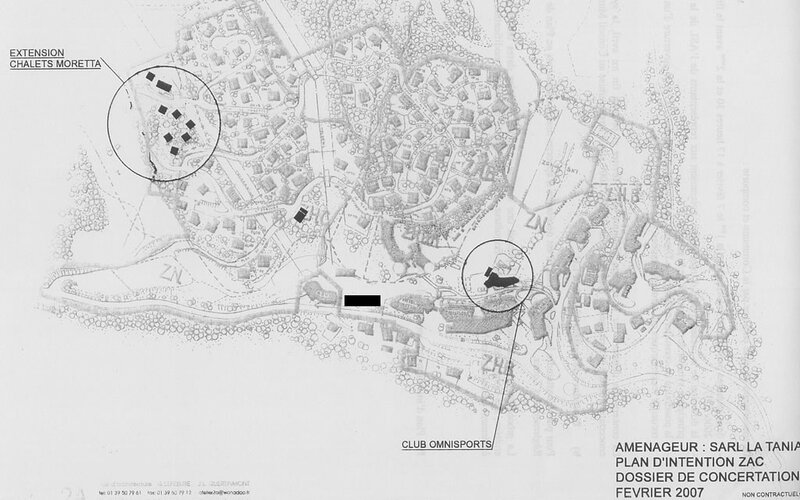 In the development plans from last year there were outline plans for the development of more chalets up in the forest , the new "Club Omnisports" and building work outlined between the Hotel Montana and the Gondola Station / Lift Pass Office area. We've heard that the Mairie has finally bought the outdoor swimming pool area at the bottom of the Troika free beginners drag lift off the construction company. This will be covered and will incorporate some kind of fitness centre, hence Club Omnisports. According to the construction company the main priority is to build on the embankment from the road between the Hotel Montana and Gondola - plans are rumoured to include a Medical Centre (or at least a Pharmacy), a local municipal Police station and a Salle de Fete (conference / festival / council room). There will also be a crèche incorporated in to the new building above - which is now quite urgent as Fernand from Le Farçon has started work on his new bar / snack place in the Maison des Enfants building (see pic above) as he is extending the restaurant in the L'Arbatt Pub. Hopefully the ESF will have an alternative crèche this Winter or other private chalet companies will step in to provide this service. Family resort? Crèches in to Pubs? To finance the above "council" building the Mairie de La Perrière-La Tania have released 1000m2 on the hill side in front of the Grand Bois to the construction company to sell to a property developer to build apartments. The building is to be built in to the hill with only 2 levels so should not affect too many Grand Bois views - and is still subject to planning permission etc and not expected until 2008/9 season. La Tania aerial photo / interactive map. The long term project is for 800 more beds over the Parking du Saz (the car park beyond the Gondola station) with Club Med and Pierre & Vacances reportedly to have shown an interest. No further news on when/if this is likely to be approved. Meanwhile the Britania apartment block above the Ski Lodge has been completely gutted and refurbed this Summer - the Polish work force are out here en masse too. Neptune Internet Services are reported to be providing wide spread internet WiFi coverage across La Tania from Winter 2007/8 in association with the Tourist Office. Access will enabled via direct connection and credit card with charges likely to be in the region of €5 an hour or €45 a week. We've a new La Tania Webcam now in place with near live images every time you visit. A new 360° Courchevel live webcam has also been installed. New for 2007/8 you can now buy your lift passes, lessons, ski hire, catering packs, GPS hire etc with Ski Holiday Extras On-line. And finally Pub Le Ski Lodge gets a new dance floor sorted out at last along with a new bar and very trendy glass shelving with blue tinted lighting! 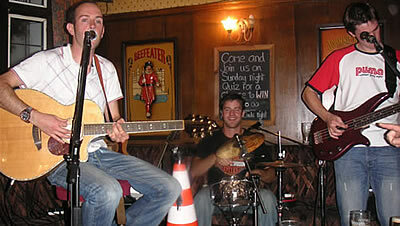 There'll be a new menu (it's ok we've had guarantees the Ski Lodge Burger will remain), plenty of returning staff and we can confirm that the excellent Bring Your Sisters (now a trio with new bass player Gareth McCain) will return to La Tania for Winter 2007/8 - they rock! Free pass now goes to over 75's (from 72) - this is the second rise in recent years, the b******'s. A one day Courchevel pass is now €37 (from 36.50) and six day Three Valleys pass is €220 (215). Morning only passes until 12:30pm will now be available. A new €10 charge has been introduced for your "free" day at Tignes/Val d'Isère (Espace de Killy), La Plagne/Les Arcs/Peisey Vallandry (Paradiski), Pralognan and Les Saisies when buying a six (or more) day Three Valleys pass. 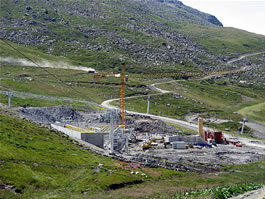 Val Thorens scheduled to open 24/11/07 - 04/05/08. 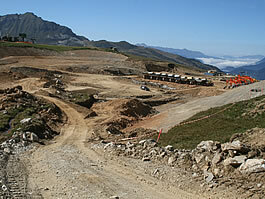 Courchevel 1850 / Méribel Valley scheduled to open 08/12/07 - 27/04/08. La Tania / Le Praz / 1650 to open 15/12/07 - 20/04/08. Courchevel 1550 to open from 15/12/07 - 27/04/08. Buy your lift passes on-line from us and don't pay the deposit (no photos required now). Courchevel 1850 has seen some serious hotel construction. No Hotel Moscow yet though. Also in 1850 the Petrol Station at the entrance to the resort has been demolished for another large hotel development - worth remembering! The ticket office in 1650 has been refurbed too. As well as the upgraded gondolas, Val Thorens sees more hotel and chalet upgrade work with more top end accommodation becoming available. Les Menuires sees the return of the Becca snow cross and fun park area plus a buggy / quad bike circuit and quite a bit of upmarket accommodation improvements too - Outdoor hot tubs are becoming compulsory and there's a new fitness and health centre. 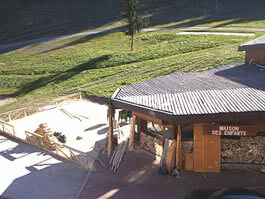 Méribel is seeing improvements to the sports / fitness centre - new sauna, steam rooms and hot tubs (obviously!). St Martin gets a new museum in the old church from December 2007.